Clifton Harski is Fitwall’s Director of Training & Global Head Coach. A lifelong athlete and collegiate basketball player, Clifton has been in the fitness industry for more than 8 years. He holds a degree in Kinesiology from SDSU. In just the last 3 years he has taught over 1,500 people while traveling the United States and conducting over 100 workshops covering different fitness systems for multiple companies, including his own. Note From Matt: The interview was recorded from a phone call and then transcribed by me. Some parts may be edited slightly for an easier read. Matt: What inspired you to pursue a career in the fitness industry? Clifton: I think it all started with my parents. I grew up living all over the world and both of my parents were very active in sports. My Mom was a scholarship dancer in college and my Dad was a basketball player. The house was just very active and we were all constantly working out. It was just part of my upbringing. At some point I realized I was a skinny 6’1” white guy and I knew that if I got bigger and stronger it would help me compete on the basketball floor. My initial interest was in competing at that higher level which then became a fascination with how the body works. How do you overload it in certain ways and how does the body respond? It all came back to performance for me. I would measure whether the exercises I was doing really helped me on the court or not. So that’s how it started. I was interested in bettering my own performance and the performance of people around me. Matt: So you earned a degree in Kinesiology at San Diego State. How do you think the degree helped prepare you for a career in this industry? Clifton: Yeah, so I did pursue that degree from the start. I played one year of junior college basketball and then went up to Sacramento State. I ended up finishing at San Diego State and was in Kinesiology and Exercise Science the whole time. I think that it was a fantastic place to start because it gave me the building blocks I needed. I had to go through Anatomy, Physiology, BioChemistry, Chemistry, and all the Biomechanics classes. It gave me a great scientific starting point. Does it translate very well to a fitness career? I don’t know if I would say yes. I think that it set the foundation for you to go and get real world experience to get better. I think there are a lot of fantastic coaches out there who don’t necessarily have a background in Kinesiology. I don’t think it’s mandatory, but if you’re young enough and you know that’s where you want to go it really does set you up for success better than any certification you might get. A degree gives you a wider breadth of knowledge to work from. Matt: Did you start to train people in-person during college? Clifton: It wasn’t actually. Nothing official. After my first year and a half of playing basketball I decided that I should start working instead. I knew I’d always be a tall skinny white guy on the basketball court with the striped socks (laughing). I wasn’t going to make a living playing. So, rather than take out loans I started to work full-time at Trader Joe’s. I ended up working there for ten years. It was a full 40 hour a week position. When I teach my workshops now I tell the participants that I think I had the best start to a fitness career possible, meaning I wasn’t in the industry at all. So, I got to be a client to many different types of fitness. I would experiment for weeks with one type of fitness like hot yoga, for example, and then go to a different type of yoga. I’d do Pilates for a month and then Crossfit for two months. On and on. I just checked the list off for all these different types of fitness with no real plan to take what I was learning and to apply it in the future. At that point Trader Joe’s happened to be a pretty good job and I was decent at it. I worked my way up to managing a store. At a certain point, maybe 4-5 years after I graduated college, the next step was to have my own store. When that happened I decided to step down to part-time and move 100% to personal training. I looked at the TJ’s position as a golden handcuff. It would have been a six figure position but I would have had to wear that Hawaiian shirt. I was 27 and I wasn’t ready for the lifestyle yet (laughing). I started my own little outdoor bootcamp company where I did four classes a week out in the grass. After college I got my NSCA certification which I let lapse because I wasn’t using it at all. So, to get back into fitness I decided to start fresh and get a number of certifications. I got a Crossfit certification, SandBag, RKC, ACE personal training, and few other things. I did an internship with Todd Durkin at Fitness Quest 10. I said that if wanted to do this I needed to get a lot of knowledge to add to my participatory knowledge. I spent all of 2010 jumping in while I was part-time at TJs doing bootcamp and occasional 1on1 clients. Matt: When you think back to when you first started working with clients as a fitness professional what lessons did you learn that were really helpful to you? What helped you leaved an impact in your clients lives? Clifton: The thing that I grasped fairly early on, which is fortunate, is that the most important thing (to me) is to make fitness enjoyable and fun. It’s not something that every fitness professional talks about. There’s a lot of people in the S&C community who almost make everything out to be too serious. They worry about setting up the optimal training program. It’s great on paper, but if clients stop showing up because they are bored then it doesn’t matter what the program was. We, as trainers, need to strike a balance. The program should be based on what we know works and based on what we know to be fun. Like I said, I think I figured that out pretty early on. One of the reasons that there are so many options in fitness is because different people enjoy different things. Matt: So while you were building your bootcamps you eventually got to the point where you were teaching coaching workshops. In addition to the technical skills you were teaching young fitness professionals what other lessons did you feel were important to pass on during workshops? Clifton: Everytime I teach a workshop I really want the coaches to not just come away with an understanding of how to teach certain movements, but when to use them with their clients. It’s one thing to really detail down the kettlebell clean for instance, but it’s another thing to say in all likelihood you’re probably not going to program kettlebell cleans for most clients. Your average client probably isn’t interested in this movement, so instead you should just have them swing heavier. Matt: You’ve been involved with FitWall since the company was just getting off the ground. How did you first get involved with the team? 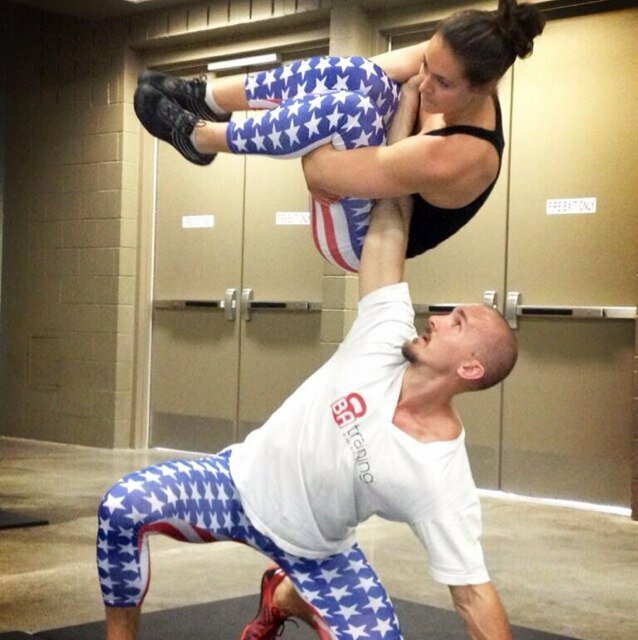 Clifton: Back in 2013 I was in San Diego and had online coaching with outdoor bootcamp classes going on. It would have been nice to have a software at that point. I was also traveling to teach Animal Flow, Kettlebell, and my own workshops. The opportunity was presented to me by FitWall to coach some of their group fitness classes. At the time they were paying $75-100 for a 40 minute class. My schedule could accommodate it so I told them I would absolutely teach ten of them a week. It was good money so I was happy to teach it. When I was introduced to FitWall I thought it was a super goofy looking piece of equipment. In the fitness industry we’re relatively conditioned to be leary of anything new because there are so many gadgets out there. We have a barbell, kettlebell, and dumbbells so your thought is why should we move away from these? You get a little jaded or on edge. So, I was looking at the ladders and bands and was just completely thrown off. But I did the workout and started to look at it from a movement perspective. All of the experience I had at that point told me that it was challenging the system in some very unique ways which were pretty damn awesome. It also provided enough flexibility to recreate all the movements I would do with a barbell or kettlebell with resistance bands. It’s not perfect in every instance, but we can certainly get very close. So I bought into the usefulness of the system and started teaching classes. I’m decently outspoken so I ended up being in charge of that studio a few months later. Shortly after that I became the Director of Training for FitWall.